Michel Domingue (June 11, 1874 -- April 15. 1876) -- The loan of 1875 – Discontent caused by the deaths of Generals Brice and Monplaisir Pierre -- Riot at Port-au-Prince -- Overthrow of Domingue. 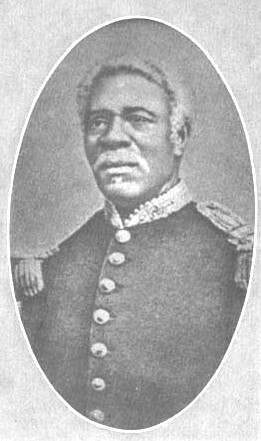 Upon his being appointed Commander-in-Chief of the Haitian Army, General Michel Domingue, who up to that time had been Commandant of the Southern Department, left Cayes for Port-au-Prince, which city he entered with a strong body of troops. His opponents at once realized the impossibility of holding out against his candidacy. Besides, the Council of the Secretaries of State, entrusted with the Executive Power, had taken such measures as to facilitate his election. Profiting by the dissidence which, by want of a quorum, prevented the legislative body from holding its meetings, they declared the two Houses of Congress divested of their functions; upon which orders were issued for the election of a Constituent Assembly. In this manner the Council of the Secretaries of State annulled the Constitution, from which all their authority proceeded; a situation fraught with danger resulted. However, the elections were speedily held; and on the 11th of June, 1874, General Michel Domingue was elected President of Haiti for a term of 8 years. Domingue, above all things, was a soldier; he possessed neither the penetration nor the tact of a statesman. Therefore he considered it wiser to leave the care of the public affairs to Septimus Rameau. one of his relatives, whom he had appointed Vice-President of the Council of the Secretaries of state by Decree of September 10, 1874. This made Rameau the true ruler of Haiti. The Constitution adopted on the 6th of August, 1874, was drawn up by him. Unfortunately, he was of a dictatorial and domineering nature; his will became supreme, whilst Domingue was but a figurehead. One of the first acts of Salnave after his election to the Presidency was the signing of a Treaty with the Dominican Republic, which the Haitian Congress refused to ratify. His object in recognizing the independence of the new State was to put an end to the unceasing hostilities which were causing so much bloodshed on the borders. Septimus Rameau immediately proceeded to resume negotiations with General Gonzalez, who was at that time President of the Dominican Republic. General N. Leger, who was then Chief of the Staff of the President of Haiti, was dispatched to Santo Domingo with instructions to make preparations for a new convention. On his return to Port-au-Prince he was accompanied by the Dominican plenipotentiaries; and on the 9th of November, 1874, a Treaty of Amity, Commerce, and Navigation was agreed upon. (1) Haiti thus accepted as an accomplished fact and fully recognized the independence of the Dominican Republic. Since that time relations between the two countries have been most cordial. The other measures adopted by Domingue’s Government did not turn out so happily. In 1875 a loan was floated in Paris concerning which the Haitian people were grossly deceived. Foreign bankers and unscrupulous agents conspired in defrauding the Republic, which was made the debtor for money from which others had profited. This scandalous financial transaction did not tend to allay the dissatisfaction already existing in Haiti. So to prevent any popular manifestations orders were issued on the 15th of May, 1875, for the arrest of Generals Brice, Monplaisir Pierre, and Boisrond Canal, who were charged with being the leaders of a conspiracy against Domingue. Monplaisir Pierre, with gun in hand, met the soldiers who were sent to arrest him; he made an energetic resistance and in defending the entrance to his house was killed in the fight which ensued; Brice, who had also made a brave defense, was successful in reaching the Spanish Consulate, where he died from time effect of a bullet wound in the thigh. Boisrond Canal, who was living on his plantation at Freres, a short distance from Petionville, was fortunate enough to be able to make his escape before the arrival of those who were commissioned to arrest him, and sought shelter in the United States Legation, which was then situated at Turgeau, a suburb of Port-au-Prince. J.N. Leger, Recueil des Traites et Conventions de la Republique d’Haiti, pp. 119, 140. With a view to organizing a State Bank the government had entered into an agreement with Mr. Lazare, an American citizen, who became unable to fulfill his part of the contract. In consequences of the obligation imposed by this contract, the Haitian Government, within the stipulated time, had deposited her quota of the capital in the vaults of the bank. It was this money which Septimus Rameau was about to send to Cayes, the capital of the Southern Department, when the uprising broke out in Port-au-Prince on the 15th of April. Domingue died in Kingston on June 24, 1877. He claims that : Rameau Domingue, nephew of the president, really ran Haiti in the 2 years of Domingue's rule. St. John believes Domingue government was the worst Haiti had to that time. It was more under control of his nephew Septimus Rameau than it was by Domingue.